The Midas Awards for the World’s Best Financial Advertising℠ announced the 2017 winners . Worldwide since 2001, the Midas Awards is the only awards show to recognize excellence in financial advertising and marketing on a global scale. Brazilian agencies were in the winner’s circle earning 6 Midas Gold Ingots. R/GA Sao Paulo’s “Next Bank,” for client Bradesco Bank was recognized with 5 Gold Ingots. The campaign promoted the brand’s mobile-only bank that empowers digital-savvy millennials while seamlessly integrating into their lifestyle. McCann Brazil earned a Gold Ingot for “Priceless Rio” for client Mastercard’s delivery of priceless experiences in Rio. South Africa struck Gold earning 12 Midas Gold Ingots. Cullinan Johannesburg’s “Give Art Life” for Absa/Barclays earned total of 6 Gold Ingots for their campaign launched to inspire young artists in Africa and create awareness for the Annual L’Atelier Art Competition. Joe Public PTY LTD Johannesburg scored 1 Gold for “Tale of a Note - Brand TVC” and 2 Gold Ingots for “Birds Eye View TVC” for Nedbank. King James Group Cape Town’s campaign “Uk'shona Kwelanga An Original WhatsApp Drama” was recognized with 3 Gold Ingots for their drama chronicling a family in real time leading up to the funeral of the deceased father and illustrating the need for funeral coverage. US agencies were out front earning a total of 19 Midas Gold Ingots. MullenLowe Boston was honored with 3 Gold Ingots for client E*Trade for their humorous campaign placing financial dissatisfaction front and center, “Don't Get Mad” earned 2 Gold Ingots and “Plane Truth” was honored with a single Gold Ingot. CP+B LA was recognized with 2 Gold Ingots “Local Selects” for client Paypal showcasing the ease and accessibility of online shopping via PayPal’s live experiential sales platform. CP+N also earned the Gold Ingot for “Schwab Intelligent Advisory” for client Charles Schwab. Grey Group Global “Ally Lucky Penny” for Ally Financial earned the Gold for their campaign designed to change the way people look at pennies. 100 pennies were distributed in 10 American cities marked with an Ally logo on one side, and the opportunity to win $1,000. Gold Ingots were also awarded to R/GA’s “Blockchain - The New Technology of Trust” for client Goldman Sachs for their website experience presenting the firm's research about the revolutionary Blockchain technology. VIA Agency’s campaign “The Power of Adjustments” for T. Rowe Price earned the Gold Ingot for demonstrating T. Rowe Price’s tenured Target Date investment team, via an acrobat’s routine, illustrating how even the smallest adjustments lead to powerful results. WHITE64 earned the Gold Ingot for “Claudia Avila” for PenFed Foundation, the Foundation honors one caregiver who exemplifies the dedication of a "Hero at Home" by caring for a wounded warrior. Zulu Alpha Kilo Canada was honored with the Midas Gold Ingot for “Mysterious Man” for Interac Association, capturing the era of payments utilizing mobile wallets and instant Interac e-Transfer®. McCann Canada’s “Priceless Surprises - Ball Hockey” scored the Gold Ingot for Mastercard. The campaign leveraged Mastercard’s shared sponsorship of the Maple Leafs and provided a fan with a personalized experience, an ultimate ball hockey court and meeting his hero, alumni player, Darryl Sittler. The United Kingdom was honored with 4 Gold Ingots. R/GA London earned 3 Gold Ingots for “Liv. - Digital Lifestyle Bank,” a digital bank for UAE millennials, for Emirates National Bank of Dubai. McCann London earned the Gold Ingot for their Mastercard campaign “BRIT Awards 2017”. The campaign inspired fans to "Live the Priceless Side of Music" by chronicling a fan’s family-wide experience with English singer, Robbie Williams. 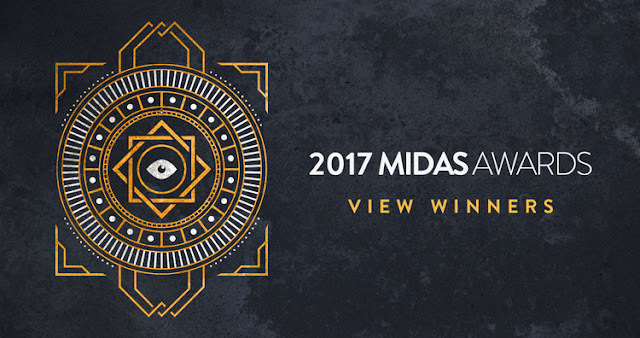 To view the 2017 Midas Awards Winners, please visit: www.midasawards.com/2017-winners-list.